Want to Increase Your Power and Bat Speed? This Training Aid Can Make it Happen! The Power Belt -- We Designed It! We Build It! We Sell it Exclusively at BatSpeed.com! BatSpeed.com's Power Belt is our newest and best batting aid yet. And it's a great teaching aid for the young players, as well as experienced players who want to improve their batting. As the batters in the videos above show, it is the natural tendency of most young hitters to rely on their arms rather than the rotation of their body to swing the bat. Therefore, the ideal time for a batter to develop a more productive rotational swing is when they first take up the game. The more a set of muscle memories for the swing are ingrained, the more difficult they are to change. The Power Belt forces the hands, arms and body in the perfect rotational hitting position much like our popular Perfect Connextion, but it gives batters more freedom to use with the heavy bag, soft toss and even light pitching. It develops the smooth transition that all batters need to go from the cage to live pitching. 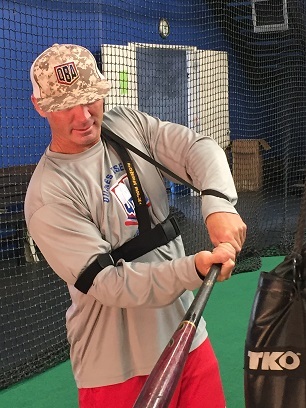 It is recommended that you use the Power Belt in conjunction with BatSpeed's instructional videos (Final Arc 2 DVD and Swing Analysis DVD) to truly understand and master rotational mechanics with the Power Belt. The Power Belt also works great with the Perfect Connextion, as the cups in the Perfect Connextion will force batter to use the correct rotational technique, and then the Power Belt will give batter a similar feel as it holds the arms in the correct position but allows the batter to have substantially more freedom and movement, so that the batter can quickly transition those same mechanics to live pitching. At first, a batter should practice with a heavy practice bag to get the feel from initiation to contact. Take advantage of our new package deals for great savings!